The long-awaited version 2.0 update for the BlackBerry PlayBook OS will finally be released on 21 February according to reports. 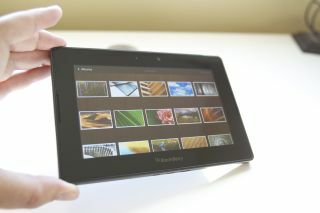 The news comes from n4bb.com sources who confirmed the release date for the PlayBook 2.0 OS. When the BlackBerry PlayBook was launched last April there were a number of short-comings with the tablet which RIM promised would be resolved in a software update. We're now in February 2012 and the update has yet to materialise but this latest news will bring some comfort to the PlayBook's long-suffering fans. The PlayBook 2.0 update is set to feature native email, calendar and contact apps, meaning users will no longer have to bridge their BlackBerry phone with the tablet just to work these trivial apps. Unfortunately there will not be a native BlackBerry Messenger (BBM) app so a BlackBerry mobile will need to be connected via the BlackBerry Bridge for access to be gained. Find out all the info on the update in our 'PlayBook 2.0: what you need to know' feature.